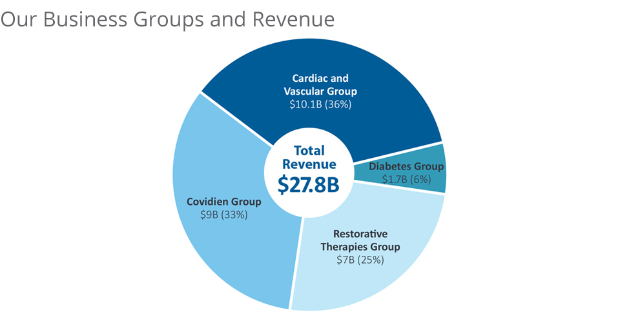 Medtronic Plc, which recently completed the $49.9 billion acquisition of Ireland-based Covidien Plc, posted better-than-expected third-quarter profits, driven by solid growth in its cardiac and vascular business. The company’s heart devices including implantable defibrillators, artificial valves and devices to treat atrial fibrillation, an irregular rhythm, contributed to a 5 percent increase in sales in the cardiac and vascular business, its largest unit. Excluding the impact of the strong U.S. dollar, sales in the division were up 10 percent. Medtronic acquired Covidien to expand the range of products it can offer to hospitals, lower its global tax burden and improve access to its cash outside the United States. It forecast revenue growth of 4 percent to 6 percent for the combined company in the fourth quarter ending in April. If the dollar remains at its current foreign exchange rate, the impact would be a $420 million to $480 million reduction in reported fourth-quarter revenue, Chief Financial Officer Gary Ellis said on a conference call. Ellis said that the company would project revenue growth in the mid-single-digit range for fiscal 2016, on a constant-currency basis. In the third quarter ended Jan. 23, Medtronic’s net profit rose to $977 million, from $762 million a year earlier. Excluding charges primarily for the Covidien acquisition, Medtronic earned $1.01 per share, above the average analyst estimate of 97 cents according to Thomson Reuters I/B/E/S. Third-quarter revenue increased to $4.32 billion from $4.16 billion. Analysts were expecting $4.25 billion. U.S. revenue rose 8 percent to $2.46 billion. International revenue fell 2 percent to $1.86 billion, hit by the stronger dollar. Excluding the dollar’s impact, international sales increased 7 percent.